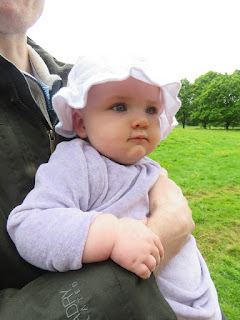 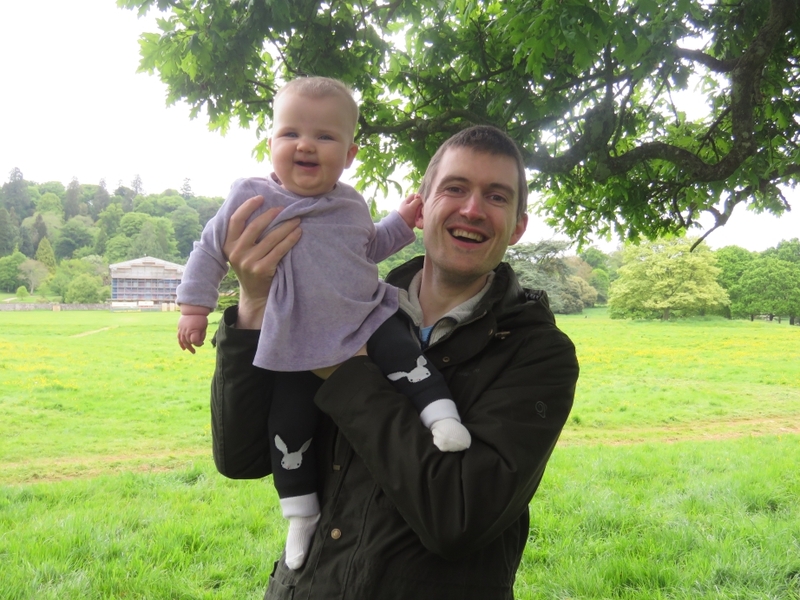 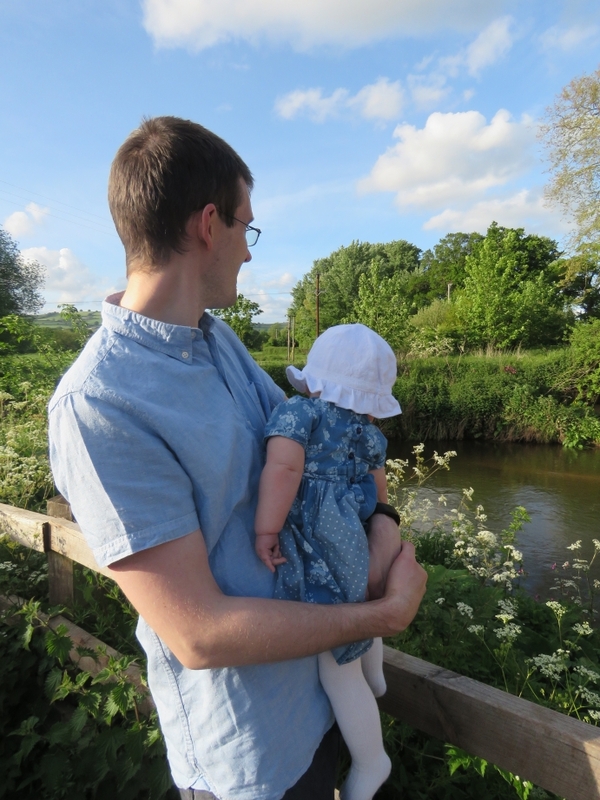 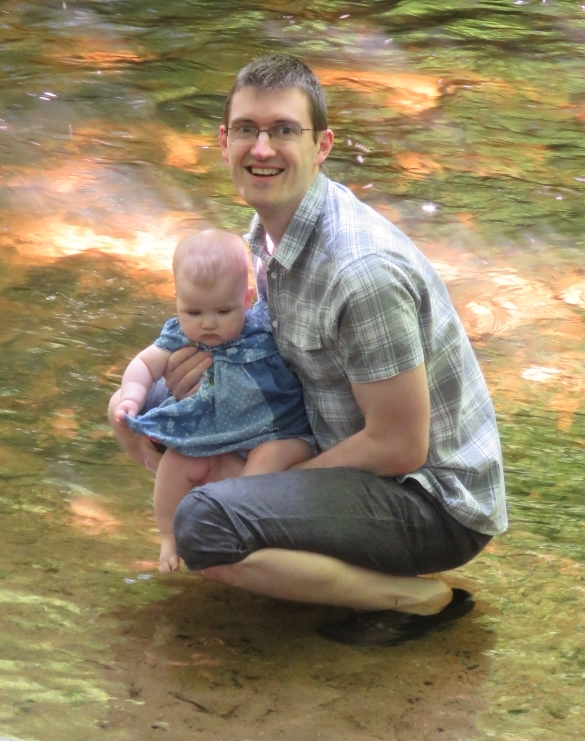 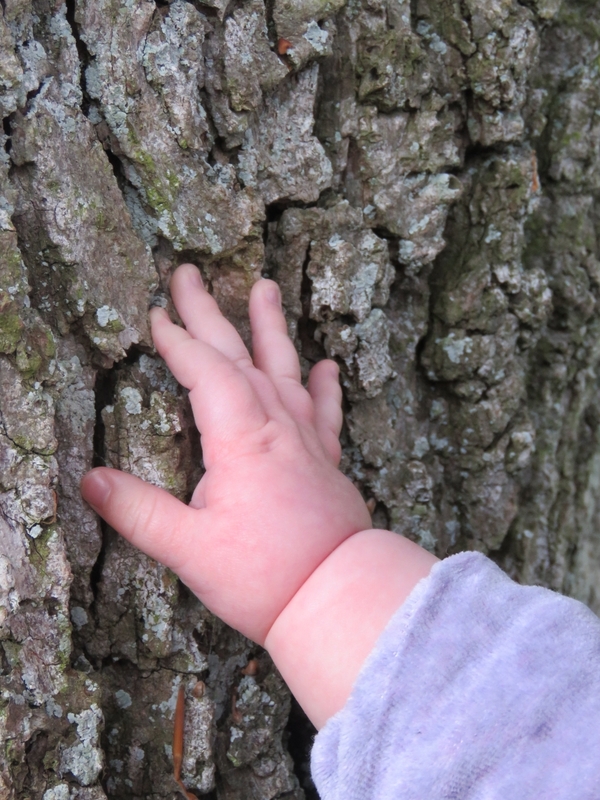 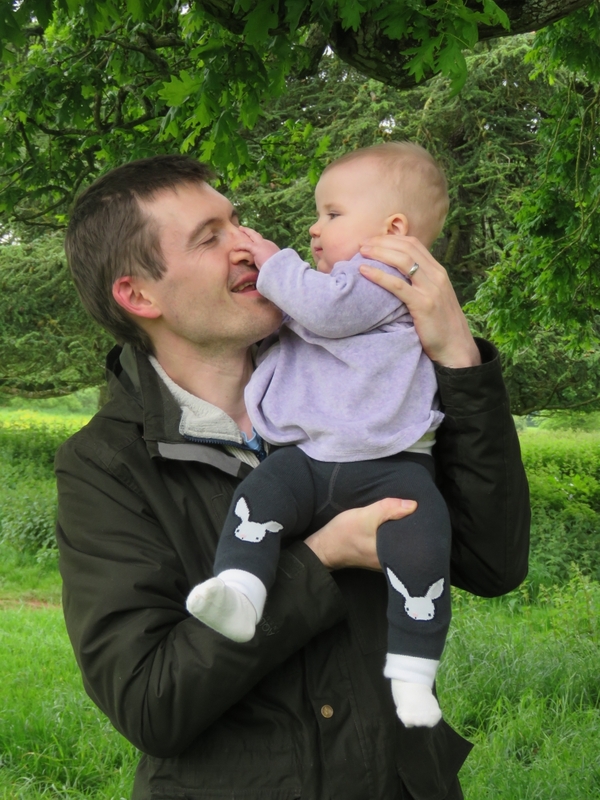 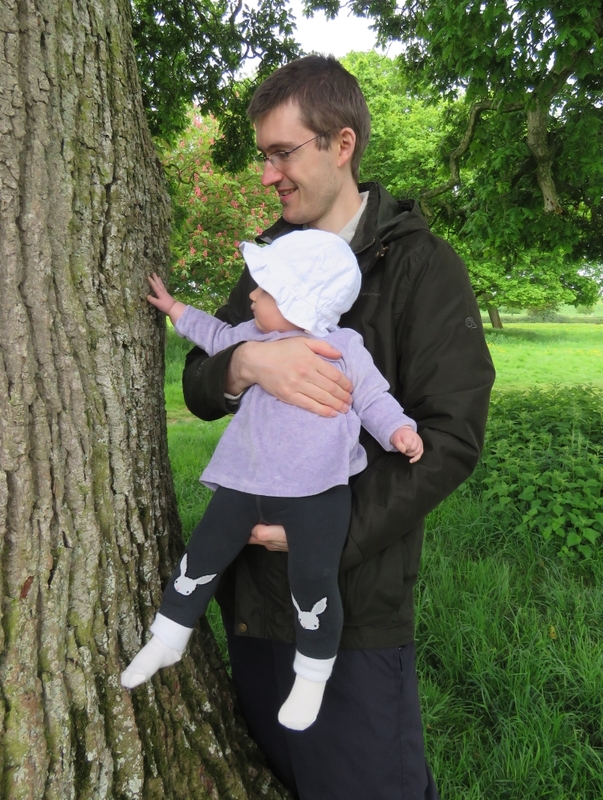 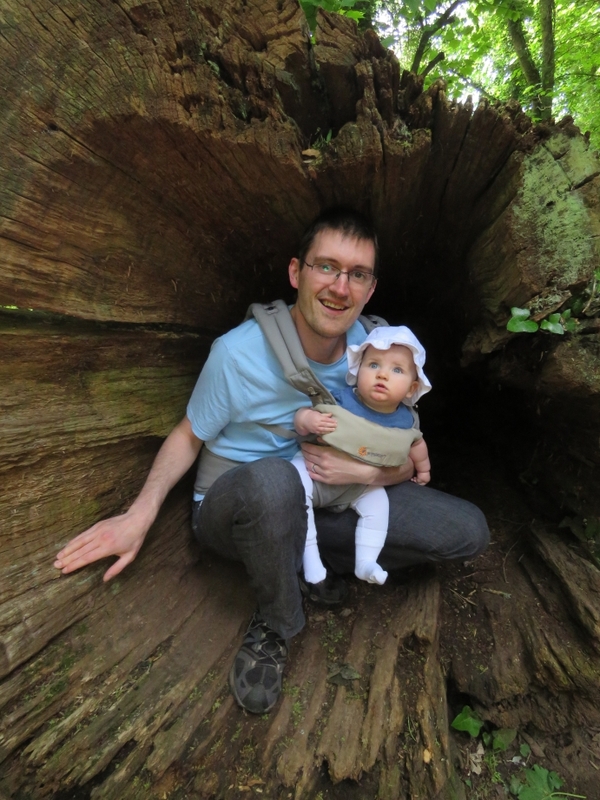 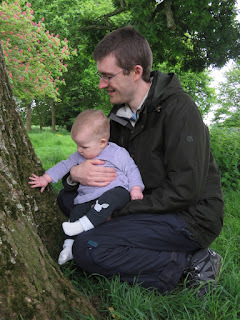 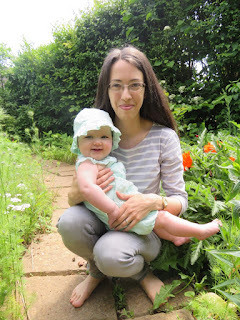 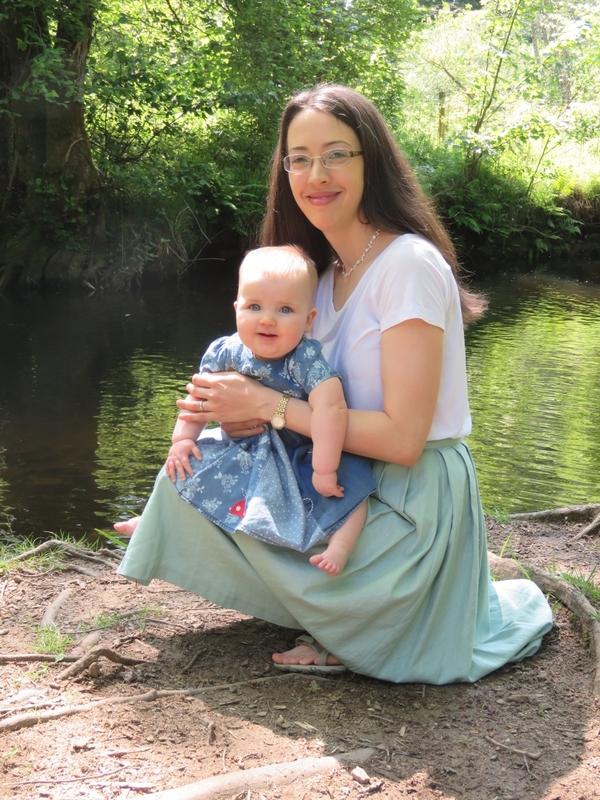 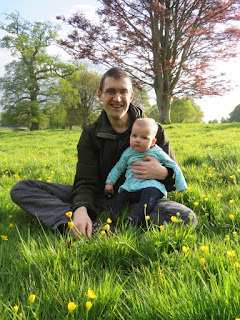 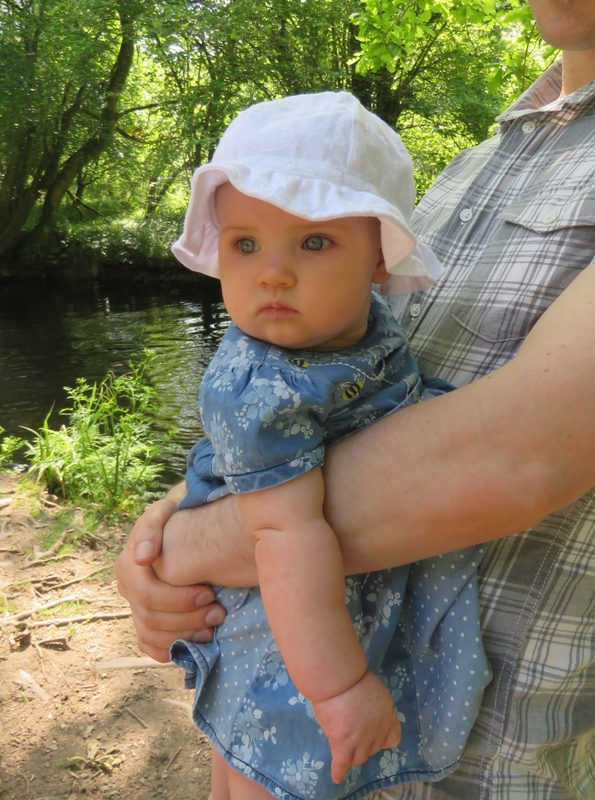 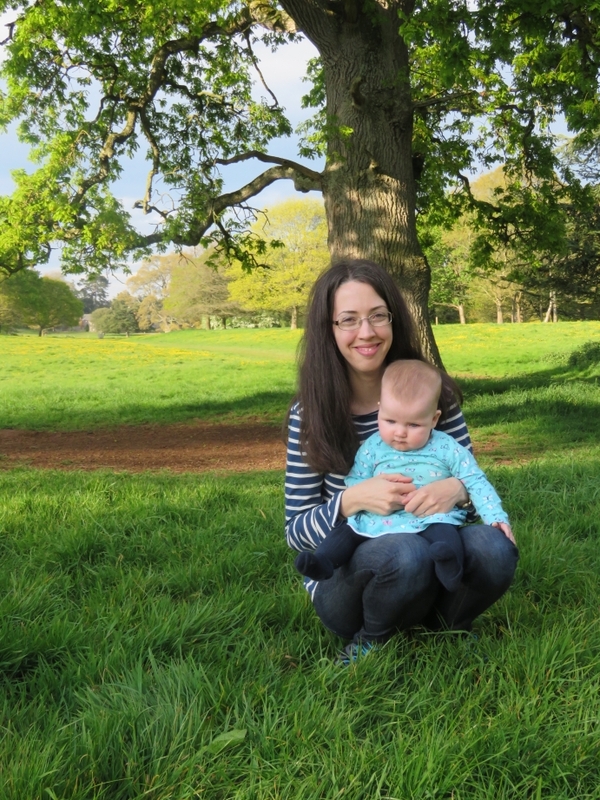 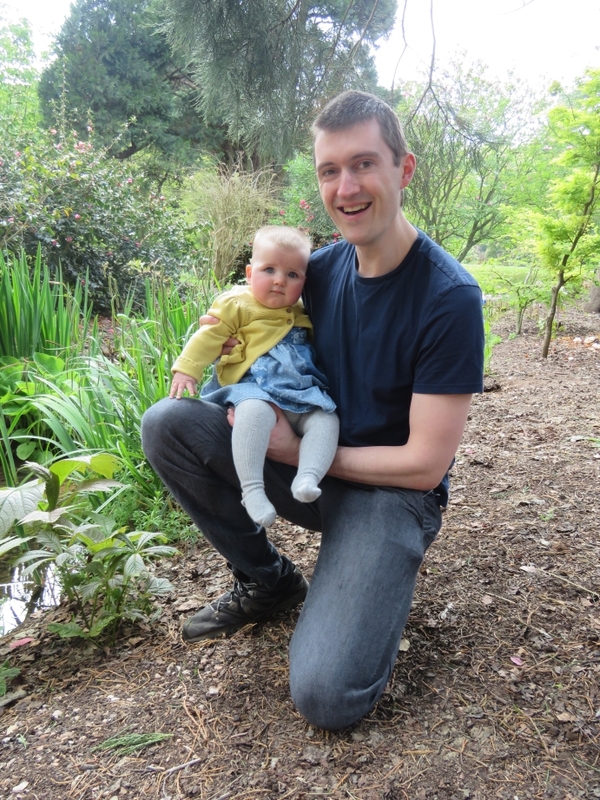 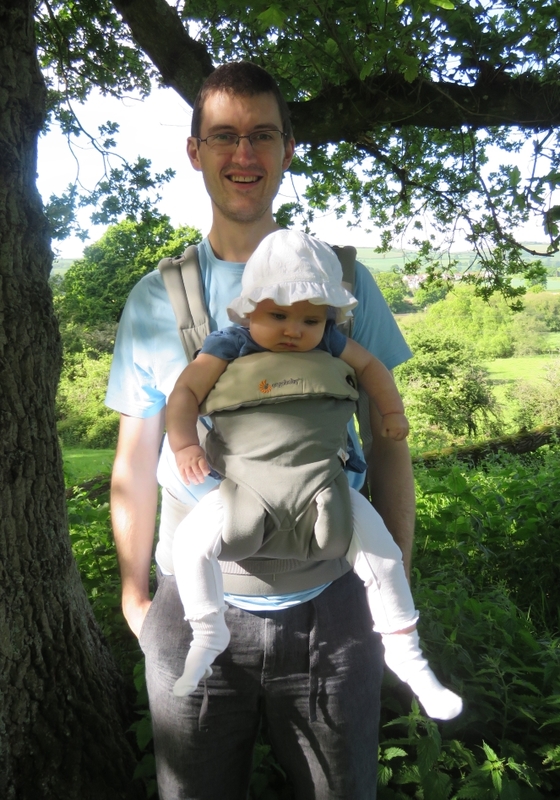 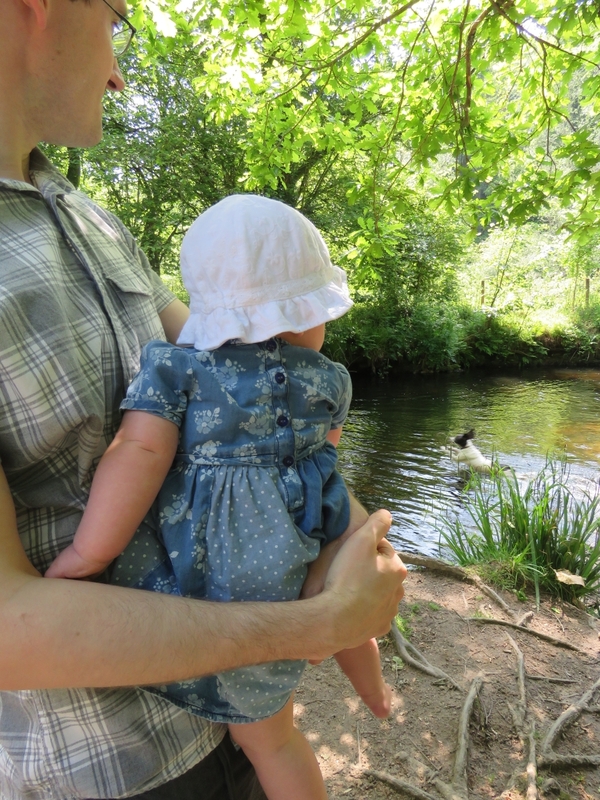 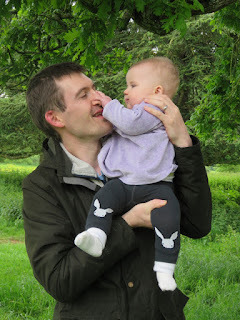 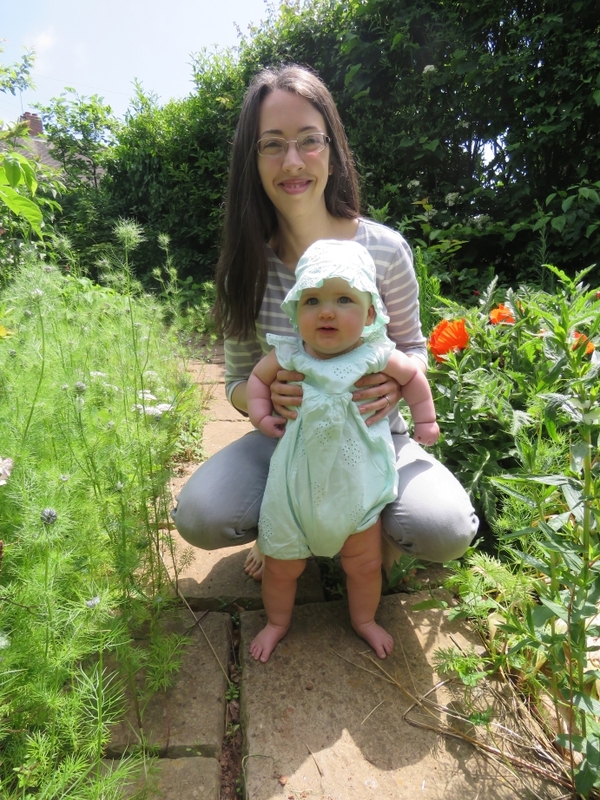 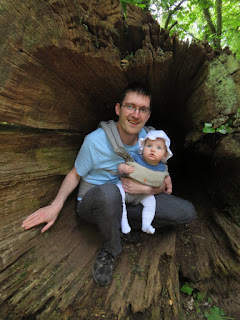 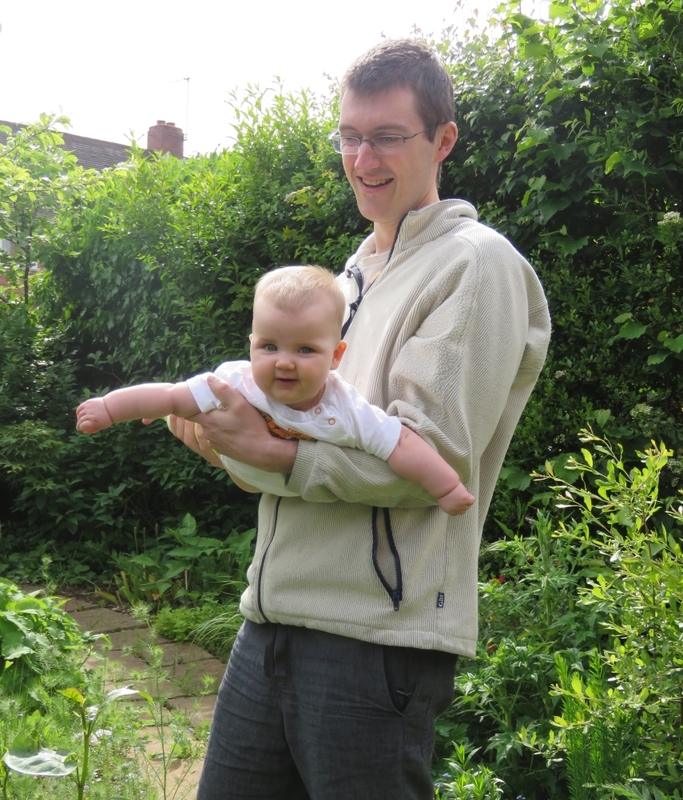 In May the weather improved dramatically so Katie (and Mummy and Daddy) got out for lots of trips to the countryside. 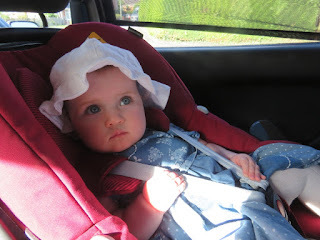 This gave her the opportunity to start wearing all the summer bonnets she's been given (even though they are still a little large). Katie loves looking at the river Culm from the car park at Ellerhayes Bridge and may have seen her first mayfly (though it was hard to tell if she was following it with her eyes). 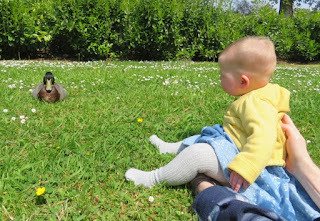 She now loves crawling over to the tabbies and pestering them, but both are quite quick to scratch so Mummy and Daddy often have to intervene. 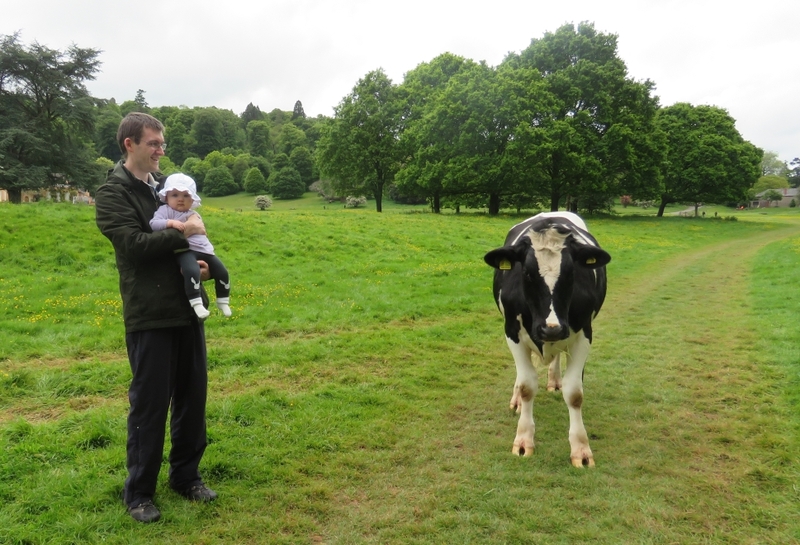 At seven months old Katie got out of the pushchair to see her first cows, although they got a little friendly and interested in her pushchair so we all had to get going pretty quick after we took some photographs. 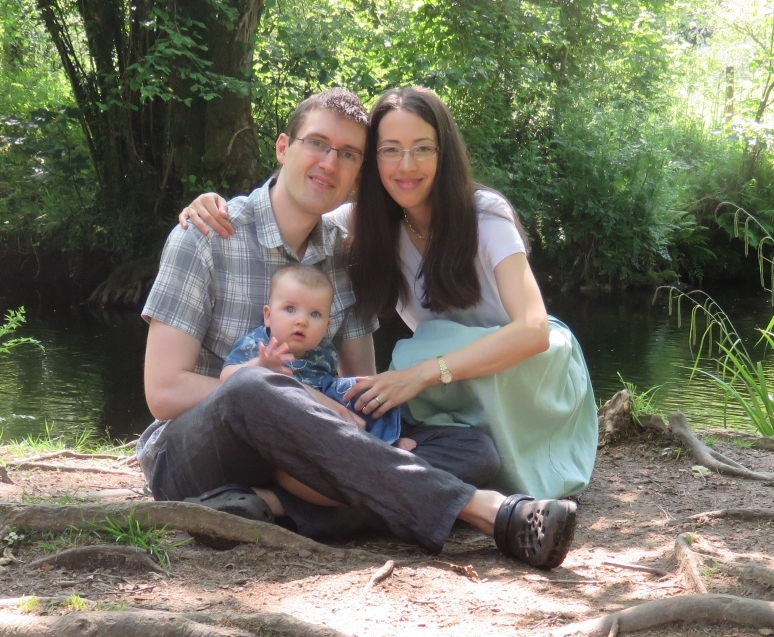 We bought a remote control for Mummy's camera so there should hopefully be more photos of all three of us from now on. Katie began crawling properly this month and discovered that she could leave a room by herself when she crawled from the study to the landing to see the vacuum cleaner. 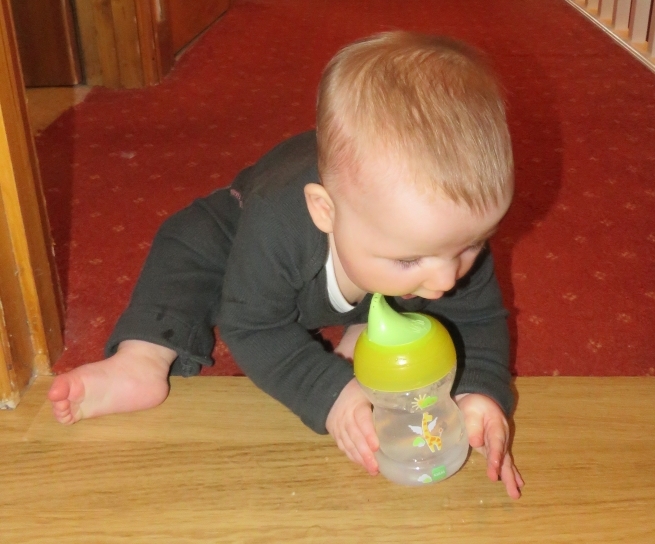 Daddy and Mummy managed to encourage her to keep crawling as far as the nursery. 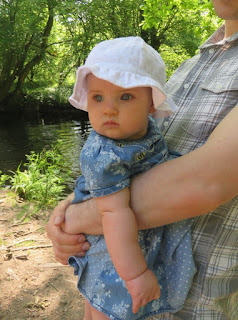 She was very tired and thirsty by the time that she got there. She also spent a lot of time standing up and now enjoys having her back to the support (usually the futon or sofa, but in this case, Daddy) as well as facing it. 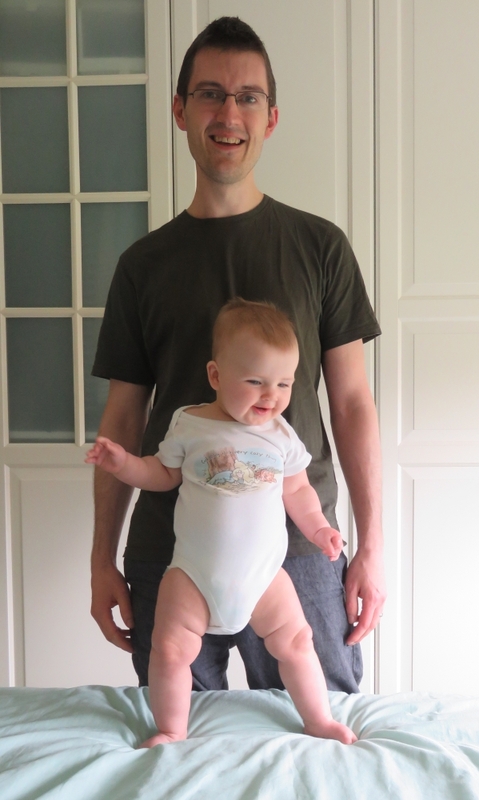 She has also begun side stepping whilst holding on to the sofa for support. She especially likes trying to get to the cat bed (preferably whilst Misty is in it). Veg: onion, garlic, celery, leek, butternut squash, red pepper, aubergine, swede, tomato, sweetcorn, beetroot. Fruit: prune, raspberry, blackcurrant, strawberry, passion fruit, guava, watermelon, red grape, kiwi fruit, blueberry, blackberry, red currant. 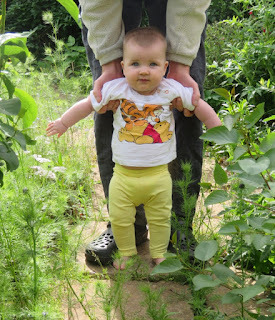 Grains: readybrek, millet, pasta, cous cous, bulgur wheat. 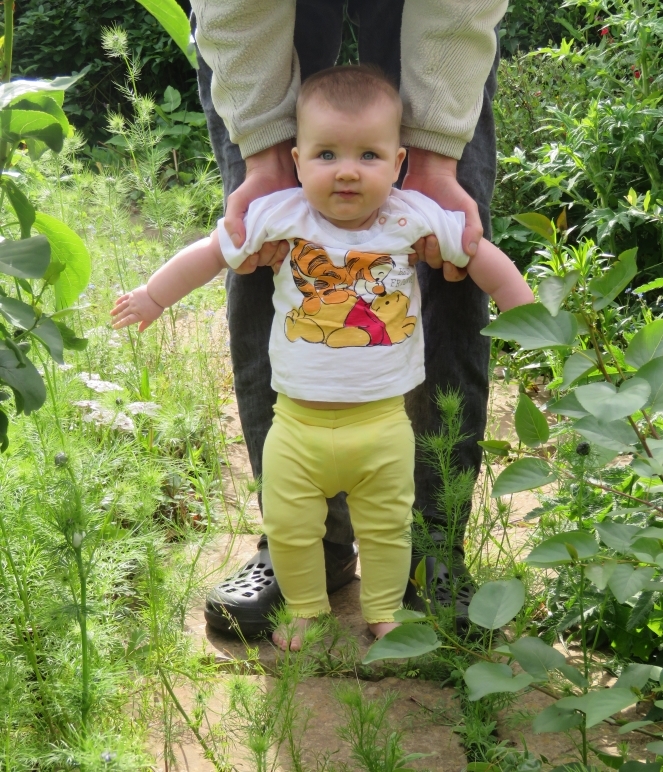 Pulses: yellow split peas, green lentils, butter beans, puy lentils, chickpeas, soya yoghurt, black beans. 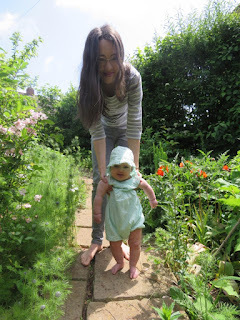 Nuts & seeds: hazelnut, peanut, almond, quinoa, chia seeds, coconut. Herbs: thyme, oregano, sage, mixed herbs, mint, rosemary, golden marjoram, chives, lemon balm. Spices: cinnamon, mild chilli powder, ground ginger, ground cumin, curry powder, nutmeg, all spice, turmeric, paprika, garam masala, vanilla.